TimeTools T-Series NTP server appliances should only be installed indoors. Locate the device in a rack, on a shelf, or in a cupboard. It should not be supported by the attached cables. Ideally, a GPS\GNSS antenna should be positioned in a location where the top of the antenna has a clear view of the sky. However, adequate signal reception can often be obtained with an antenna located on the side of a building or in a window. Alternatively, indoor operation is sometimes possible, providing the building is not metal clad or metal framed. 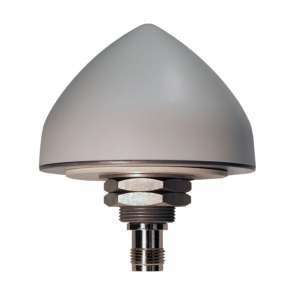 The supplied antenna mount can be used to fix the antenna to a wall or vertical surface or to a mast using the supplied V-bolt. Connect the supplied coax cable to the GPS\GNSS antenna and to the antenna connector at the rear of the appliance. The TNC connectors on the antenna and appliance should be fully screwed home, but do not over-tighten. The T-Series has either one or two 10/100MBit RJ45 network connections. Connect an Ethernet cable to the network connector on the rear of the appliance and to a network hub or switch. Alternatively, for configuration purposes, the appliance can be connected, peer-to-peer, directly to a host PC network port using a patch cable. For the T300 and T550 mains powered models, apply power by inserting the supplied mains lead into the IEC inlet at the rear of the appliance and into an appropriate AC power source. For the T100 DC powered model, apply power by plugging the supplied power adapter into the appliance and into an appropriate AC power source. On power-up, the alarm LED will rapidly flash red/green for 30 seconds to indicate that the device is booting. All models have a default IP address for Ethernet Port 0 (Eth0) of 192.168.3.222\24. The T550 has a second Ethernet port configured as a DHCP client. If the installation network has a DHCP server, the T550 ‘Eth1’ network port can be used to automatically acquire network settings. Before configuring the T-Series NTP server, you will need to acquire some basic network configuration information, such as IP address, network mask, gateway and DNS servers. Configuring the T-Series NTP Server Network Settings. Open a browser on a PC on the same network segment as the NTP server. Enter the appliances IP address into the browsers address bar. At the login page, enter the devices default password ‘admin’. To Change the devices network settings, click the ‘Network’ button at the bottom of the status page. Enter the IP address, network mask, gateway and any other network options you may require and click ‘Save’. In order for the settings to take effect, the device must be restarted from the ‘Local’ menu. At first power-up, the GPS\GNSS receiver will search for satellites in order to perform a self-survey, which will take 30 minutes to complete. A survey will not be required for subsequent power-ups, provided the antenna has not been moved. A further 10 minutes is required to synchronize NTP. Only when NTP is synchronized can network time clients obtain time. Before installing any T-Series NTP server, please read carefully the supplied documentation and safety instructions. Full product documentation can be found on the supplied CD and online.